As mentioned over the summer, the Massachusetts Legislature passed bill H.4857 aimed to promote a clean energy future. The new law changes concern renewable requirements and all MA customers and suppliers will be affected by these increases. Each supplier may treat these requirements differently. Executed agreements currently in effect or those which have not started yet may see these increases as pass-throughs effective starting in 2019 and 2020. 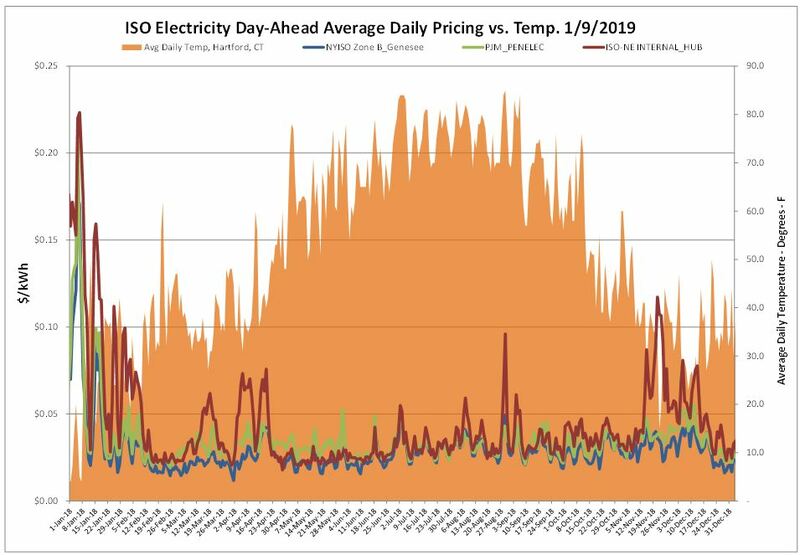 Another change coming to all of New England- suppliers will be collecting costs or charges that are incurred by load serving entities in the ISO New England service territory associated with fuel security reliability. This program is a partial replacement for winter reliability program and trying to accomplish similar objectives. On future contracts the increase will for most suppliers likely be listed as a pass-through charge as the exact impact per customer is still uncertain. 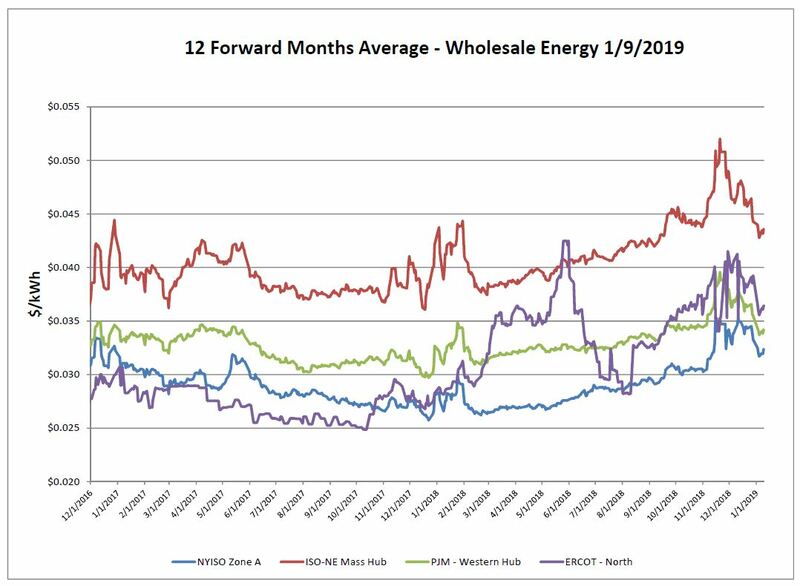 The downward trend on the electric market over the last few weeks was stopped with a slight uptick in all ISO’s over the report week. End of December into January showed little volatility on the day-ahead market as temperatures were widely normal to slightly above normal. While slightly up over the report week, current prices are quite a discount from the elevated settle price back in December. 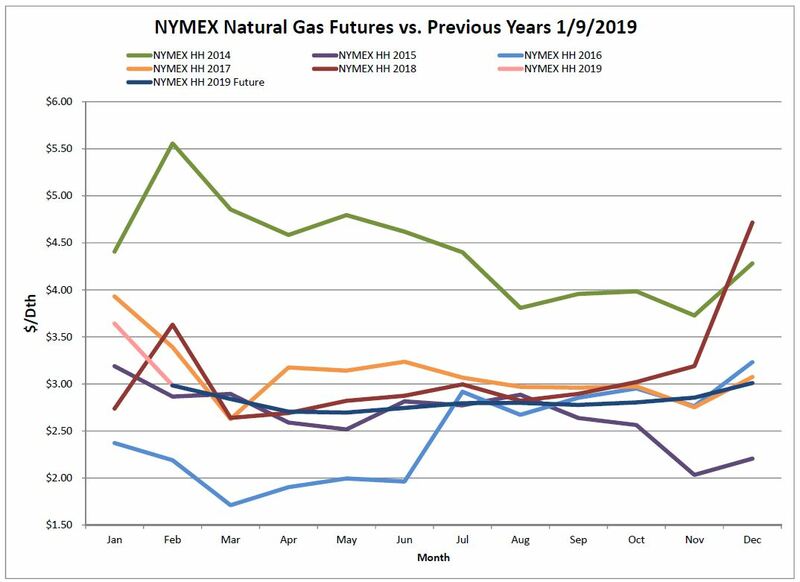 The flat 12-month NYMEX strip (not heating load weighted) is currently trading at $2.84, while 1 month ago it was $3.25. The NYMEX + Algonquin basis was $5.11 one month ago and is currently $4.68. This trend is a bit unusual as many times January and February winter months trade on the high end. Forecasts for snow and the return of winter weather on the east coast did put upward pressure on prices at the end of this report week End of the month forecasts are calling for some below-average temperatures along the east coast which should increase demand. There is still plenty of winter left to change the dynamics, so if you have been holding out, it may be wise to act on these attractive prices while available. Nuclear outages across the country have averaged more than 4.2 GW thus far in 2019. That level represents a more than four-fold increase over the same period in 2018. As of Friday, January 4, 2019, a net decrease of 87 Bcf from the previous week was reported. During the same week last year, the largest withdrawal on record has been reported at 359 Bcf. This week there was some good ground made up as this withdrawal was much below both last year and the 5-year average of 187 Bcf. 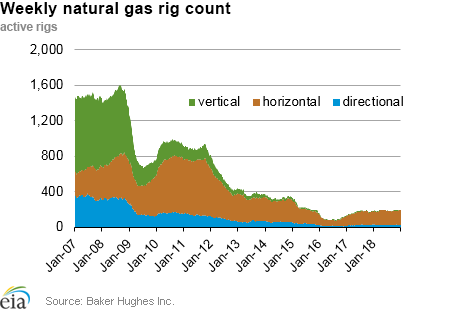 The Baker Hughes exploration gas rig count increased 4 rigs from last week for a total of 202 rigs. This is 15 more rigs than were in operation at this time one year ago when there were 187 rigs. 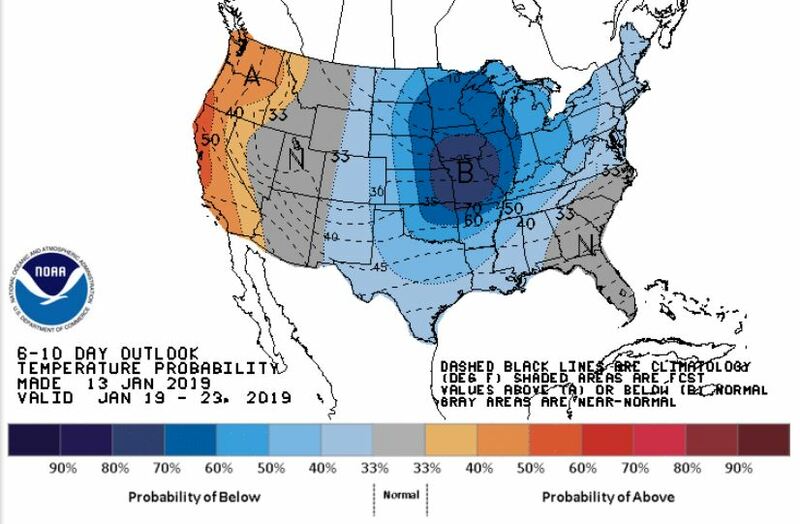 The NOAA 6-10 day outlook anticipates a return of below average temperatures to the east coast and Midwest. Many of the Southern states may also see some cooler temperatures with the exception of Florida, Georgia and South Carolina. 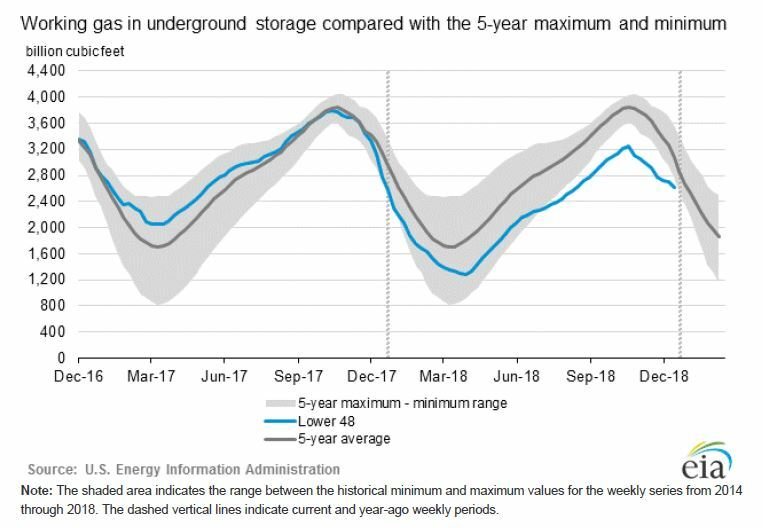 EIA projects that U.S. liquefied natural gas (LNG) export capacity will reach 8.9 billion cubic feet per day (Bcf/d) by the end of 2019, making it the third largest in the world behind Australia and Qatar.